Amber Menefee was born December 11, 1984. She was raised in Andrews, Texas, where she graduated from Andrew’s High School in 2003. She was a member of choir, a cheerleader, voted class favorite, a member of the varsity girls basketball, volleyball and track teams. She graduated from South Plains College with an Associate of Arts degree in December 2005, where she was on the Dean’s Honor Roll, carried a 3.42 GPA and was a member of Phi Theta Kappa International and National Honor Society. She was currently attending Texas Tech University where she was majoring in early childhood education. She attended the Andrews Church of Christ. Tragically, on February 11, 2006, a promising life came to an end. Twenty-one-year-old Texas Tech student Amber Menefee died when her car collided with a SUV that was traveling the wrong way on the West Loop in Lubbock. The driver of the other vehicle, 20-year old Erin Reagan, had a blood alcohol level of 0.147, nearly double the legal limit, at the time of her arrest. Erin was indicted on intoxication manslaughter, a second degree felony, punishable by up to 20 years in prison. In the Spring of 2006, Rodney Jones, Paramedic for the City of Paris, was contacted by Rachel Bruton, Amber’s friend since kindergarten, about using Amber’s mangle car and her tragic death to make a difference in the lives of others. Jones, teaming up with Paris Police Officers Association President Sam Owens, traveled to Lubbock to meet with Ms Bruton and Amber’s mother, Brenda Menefee, and to take possession of the wrecked car. Once in Paris, several people and businesses quickly began getting involved in making the mobile memorial a reality. 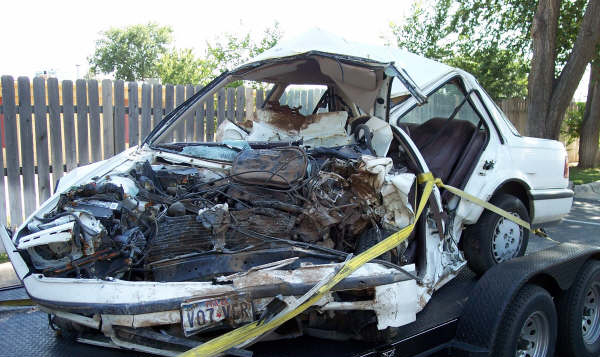 The Amber Menefee Mobile Memorial is available to drunk driver awareness programs, school and community events to demonstrate and educate the catastrophic effects of drinking and driving. Amber Mobile Memorial © 2019. All Rights Reserved.